Julie Jones shows off the tip she'll never forget. Customers lined up outside Richard Walker’s Pancake House on Front Street in Downtown San Diego Tuesday. The restaurant is busy with the holiday and the Poinsettia Bowl crowds in town. Inside, the buzz isn’t just about the holidays, the game or the food. 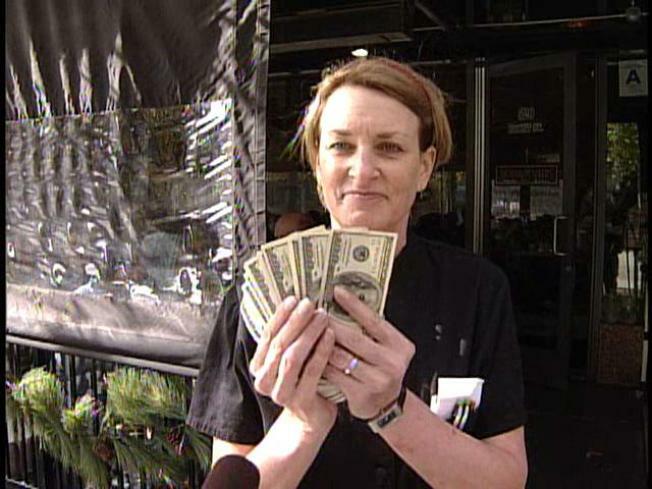 One of the employees is the center of attention because she’s carrying around $1,000 in cash – a tip from a customer. When Julie Jones arrived to work, the restaurant owner, Richard Walker, told her a customer wanted to give her a special tip – ten $100 bills. The customers who gave her the tip come in once a week on average. They had arranged the gift with the owner a few days ago. What does Jones do to warrant such a generous gift? She’s got such a great attitude and always keeps their coffee and waters full, according to the owner. "Business has been really great and I think it's because of people like Julie Jones who have made us the success we are," said Walker. "It's a wonderful gift just before the holidays," said Jones. "Thank you to whoever sent it to me."